After the Honeymoon Phase: Why Are We Fighting? By this time in the relationship, the two of you are comfortable around each other, but there are things that now annoy you that you may not have noticed in your love-struck beginning. Most likely it something small, like the fact that he leaves a mess of his belongings every time he comes over. Or maybe you come over and cook dinner, but leave all the dirty dishes for him to clean up. Whatever it is, try not to let it get in the way of the relationship. 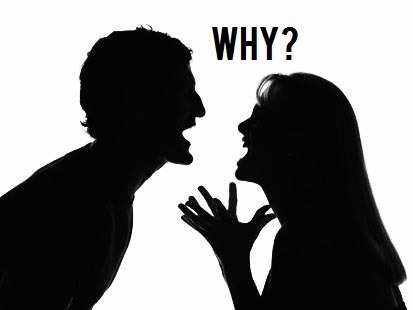 Think before you speak: before you snap at him, think about why you're frustrated and angry. Is it really directed at him? If it is, is it worth it to fight about it? Will winning the fight make you happier? After you snap, take it back if you didn't mean it. We get it, sometimes when we're stressed or not feeling our best, we are sometimes a little harsh with our SO. But if you say something and realize you didn't mean it to sound so demanding, take it back before it escalates into a huge fight. Explain that you're just stressed and you didn't mean it in that way. Have a discussion instead of holding it in until you blow up. One of the worst things you can do is avoid discussing a big issue until you explode. If something really bothers you, talk to your SO about it. If you know you want to stay with him, instead starting a fight, do the opposite and do something loving to bring you closer together, rather than breaking you apart. You might be surprised how far a little self-restraint goes!